The Honda and Suzuki gaskets are about the same thickness. Replacing with the Honda gasket can fix it temporarily, just by virtue of being a fresh gasket, but probably not much better than a new stock gasket. Rotating or flipping the stock gasket fixes the leak on some caps, but again, probably not for good. I imagine it will eventually pack down and get loose again. The spud washer is thicker than stock, but not always made of a gas-resistant rubber, so you have to treat it with gasket dressing to be sure it won't swell or dissolve on you. The best options seem to do that (use a spud washer and treat it) or shim up the Honda or Suzuki gasket somehow. It is not necessary to roll your own gasket. 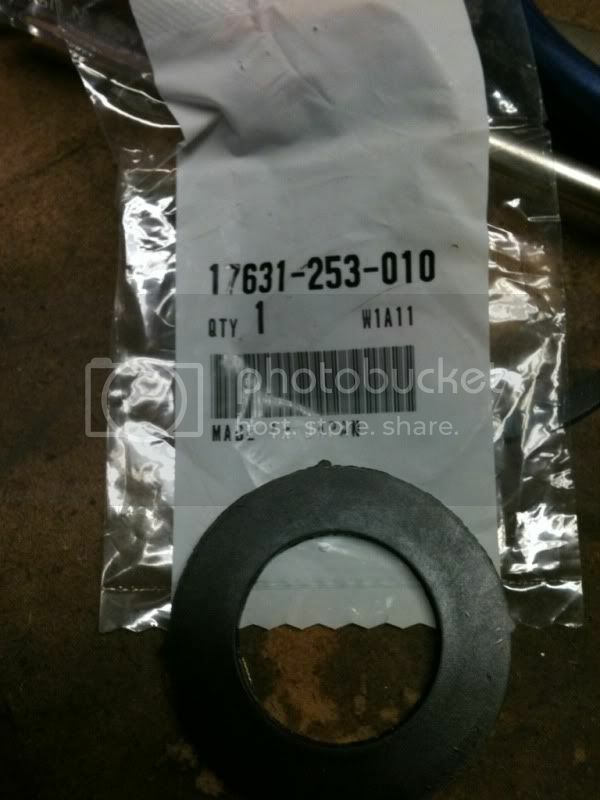 If you go with the Honda gasket, the part number is 17631-253-010. Thanks Tjfisher for the tip. If you'd still like to make your own gasket, read on.. Yes folks, this is how it's done. A little trick critically acclaimed as "one of the best and simplest mods available" And it really is simple, so simple even I can do it.. and you guys have seen me screw up stuff so simple a monkey could do better. The hardest part is sourcing the gasket. Luckily I have a plumbing shop nearby, one of those warehouses where only the old codgers who work there can find anything. They let me wander aimlessly around with my cracked, too-thin stock gasket in hand until I found a suitable replacement. It turns out that replacement is called a 3/4" spud washer. Why it's called 3/4" I don't know. There is nothing 3/4" about it. These are the gaskets that fit onto "spuds" which in plumbing parlance are the fittings that connect wall-mounted toilet tanks (or urinals) to the water supply. I THINK (but don't know for sure, will edit later) that this washer is it. NOTE: The gaskets are only 79 cents but they are charging $8.45 to ship(!) At that rate, you might want to do a small batch of gaskets, order a dozen or so stuffed into the same box. We need a guinea pig to order one and let us know if it's the correct dimensions. Or if someone can find someplace that does not require you to buy 100 of them packed in $8.45 worth of whale lard from China, let us know. Verify the dimensions. The outer diameter looks about 2 1/8"
The inner diameter is roughly 1 3/16"
And the thickness of the disc part of the gasket is about 5/32"
Take a sharp new x-acto blade and slice off the flange, holding the blade flat against the "washer" part. At this point the gasket is probably good enough to install, and if you don't feel like buffing it down perfectly flat.. don't. But noOoOOooo, Mr. Brilliant must have it PERFECT! Yes, the gasket nazi suffers for his gaskets, risking life and fingernail.. Well anyway, just keep the gasket moving and your fingers clear, and this takes almost no time at all. They really do look good, fresh off the sander. Rinse all the little rubber crumbs off the gasket so they don't end up in your tank. Ok, so time to install this thing and start enjoying gas-free pants. Take out your gas cap and remove the two screws that hold the lock cylinder cover on. Onion not required (it will reek enough to your wife's dismay as-is). Remove that little bezel, pry out the old gasket, and replace it with your new SUPERGASKET Note how the six nubs around the inside of the cap squeeze the gasket tight against the lock cylinder and plumps it up. The rubber is fully bound from three sides and ready to put sufficient pressure against the tank, and not leak a drop. That's it.. put the bezel and black cover back on with the two screws, and go fill up your bike knowing the cap will seal like it's supposed to. How does the rubber in that gasket stand up to gasoline? Is there any swelling? There's no swelling. The last picture actually shows the gasket I made several months ago. It now takes slightly less pressure to close the cap, because the rubber eventually bedded into the filler neck. I don't know how the gasket will stand up to gasoline in the long term. But I DO know that the stock gasket was cracked when I bought the bike (4 years old) and the new one is still perfectly pliable. The only sign of use is the impression from the tank. A good sign. If the rubber was incompatible w/ gasoline, I think it would have swelled fairly quickly. Boule, one quick questoin. The 6 lil nubs that hold the gasket down. Do they have to be pryed open or does the gasket just slip in under neath them? Thank you for this info and I don't need it yet like Piglett, if I do I know where to find it..
Haven't really looked at mine, but if that piece is cast rather than stamped, for cripes sake, don't try bending them; they'll snap right off! If the rubber's halfway bendy, a person should be able to wiggle them out and back in without doing anything to the tabs, maybe? ..The 6 lil nubs that hold the gasket down. Do they have to be pryed open or does the gasket just slip in under neath them? The nubs hold the gasket inward toward the lock cylinder, not so much "down." There is no need to deform them to get the gasket in, just compress the gasket slightly so it fits between the nubs and cylinder. I'm glad you guys are finding this info useful. If you have any trouble finding the spud washers, send me a message and I'll pick up a half dozen or so from that plumbing shop. I also have an idea for version 2.0, which is to sort of "grease" the washer with Permatex gasket dressing. That would seal the pores of the rubber and make the cap glide on and off really nice. I just got http://www.azpartsmaster.com/Products/Spud-Washer---1-to-1-14-x-34-Urinal__91... and darn if they did'nt charge $8.45 for S+H. A bit redic if you ask me. When she comes in I will post a report. Those bastards. I am going to edit the 1st post to include a warning about their shipping charge. Thanks for the heads-up, and we will be curious to see if the rubber from that one plays nice with the gas vapors. I went to Home Depot, and everyone thought a spud washer was some kind of a kitchen appliance for potatoes. Went to a plumbing supply house, and found out why. A spud connection is used on urinals. Home Depot doesn't sell a lot of urinals.. The only spud washer the supply house had was as part of the connector. Hmmm.. look around some. A lavatory drain washer is also the size as specified by Boule’tard. The only difference is that is has a dome lip that needs cut off instead of a straight lip. So, if you don't have a plumbing supply house in your area, try a Home Depot or Lowes, and look for a lavatory drain washer. BUT, make sure you measure!! As it is possible to have different sizes of those. P.S. The "3/4" part of the "3/4 spud washer" refers to the size of urinal supply line. Now you know. I am not sure one of those would stand up to gas. That concern was raised on page 1 by Digger. The rubber I used held up fine to the gas vapors and splashing. I realize that some guys may be cutting their gaskets from spud washers not as gas-resistant, or may want to fill their tanks chock full so that the gas is in contact with the gasket a significant amount of time. For those reasons I recommend putting gasket dressing on the gasket before installation. If I do another batch, they will have it. This stuff is what I'd use.. I got it from Autozone. Finally found a spud washer. None of the plumbing supply stores in London had one, or a lavatory washer the right size. I had to buy the whole spud assembly to get the washer ($8) at Rona. Did the mod works great. The gasket went punky after a day and leaked brown tar onto the top of the tank. Guess it wasn't gas proof after all. Next I will try to add 1/16 gasket material on top of the old gasket, glued together with liquid gasket stuff. I think the real problem is that the sealing lip on the tank had rusted and did not make a good seal. I plan to clean it up with emery cloth as well. Any ideas as to how to avoid getting abrasive material in the tank would be greatly appreciated. Well I did it. Taped off the tank and flattened the contact area, and put the 1/16 thick piece on top of the old gasket. Worked a charm! I have to push down a bit on the cap to get the clips to engage, but no more leaky leaky.